Yep. It certainly can be. But then anything has the potential to become boring – even the most positive outlook can struggle to find interest in mundane tasks done repeatedly. So why willingly submit yourself to possibly the least interesting form of cycling? This is a question I am often asked by guys I ride with who see Strava updates from me regularly cataloguing some recent bout of indoor torture. In a probably long winded and roundabout way, I’m going to attempt to answer that question in better fashion than I usually manage whilst gasping for breath trying to keep up with the person who asked it. I love cycling with a passion, but it’s not the most important thing in my life – without qualification, that would be my family. It’s not even the second most important thing in my life – that would be my work. In a world full of obsessed people telling us to “do what we love“, I prefer to take a much simpler path – to love what I do. Work is what provides for my family, helps give me direction and purpose, and provides funds to fuel the passions I enjoy in my spare time. Yep, work can be dull – but nothing of itself can truly be boring, because boring is a perspective, a conclusion from a negative viewpoint. I prefer to accept the tedious moments as another part of the journey, the rain that will pass, the wind that will subside, the climb that will end. Those are no different at work than on a ride – the joy and the reward comes from the whole. Edited highlights are for talent shows – real life is about learning to enjoy, and endure, the grey bits in between. But this outlook is not why I find indoor training tolerable, although at times it helps. What makes it tolerable is the specifics of why, and how, I do it. First and foremost, it comes down to time. With cycling sitting at priority #3 in a good week, and sometimes far below that, there is always a battle to find time to actually go and ride. Weekends are family time, with the concession of one weekend most months for an Audax ride – which for the longer rides can sometimes consume the entire weekend. And Wednesday mornings are blocked out for the regular 100km club rides. Although in winter, as we are now, Cape storms often rain or blow out the ride. In a good month, that amounts to a total of around 5 rides, and very often less. So, I joined the ranks of many other cyclists who turn to indoor training as a way to shoehorn in some extra time on the bike. But, as with every discipline, you need to understand how it works and what you are aiming to achieve. There’s plenty of articles on the Internet about High Intensity Interval Training (HIIT), written by actual coaches who understand more about training than I ever will. So I’m not going to rehash any of that here – it’s not the point of this piece anyway. But in short, you don’t simply replace a four hour ride on the road, with four hours sitting on a trainer. Your indoor trainer sessions are short (typically an hour, occasionally more) and excruciatingly painful, with bursts of lung bursting suffering, interspersed with never-quite-long-enough recovery intervals. This is where the time efficiency aspect comes from – in a week where there is just no room for another two or three hour ride, it’s often very possible for two or three one hour sessions squeezed into a lunch hour, or before or after work. 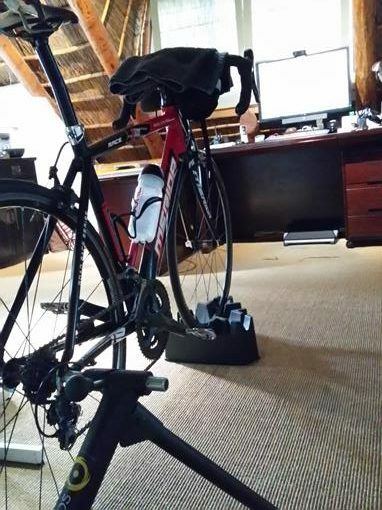 The “how” part is also a tried and tested formula – a resistance controlled trainer (in my case a CycleOps PowerSync+) connected up to a training program on my computer (in my case TrainerRoad). This article isn’t intended to be a review of either of those – suffice to say that together, they do the job I need well enough. The last ingredient of the setup is videos which provide both a variety of structured interval sessions, and some music and moving wallpaper to keep things at least reasonably entertaining during the pain. My most used videos are without doubt the SufferFest collection, of which I have a largely complete set although some get ridden much more often than others. What I like about the overall combination, and I suspect what has made it so popular is the feeling of some measurable approach to each session. I have a measured FTP (Functional Threshold Power), and on-screen I can see the effort level required for each interval, adjusted to my specific FTP. There’s no guessing whether I’m really riding at an RPE (Rated Perceived Exertion) of 7.5 – I can see exactly whether I’m hitting the current power target, at the appropriate cadence. Literally all I need to do is look at the pretty pictures, enjoy the music, and pedal until the interval ends, or my lungs burst. So the “why” is easy – efficient use of time. And the “how” is no more complicated – bike, trainer, computer. But what of the boredom? Does keeping the sessions short, and adding a video and some music really cancel that out? Well, yes and no. The first few times through a session, there is definitely a novelty factor. But after a while the regularly used intervals sessions do, of course, become very familiar, just as local rides do once ridden a few times. No two journeys are ever quite the same though. Outdoors, with friends, the riding company changes and the scenery varies with the weather. Indoors though, the journey that changes is the one taken inside your own mind. 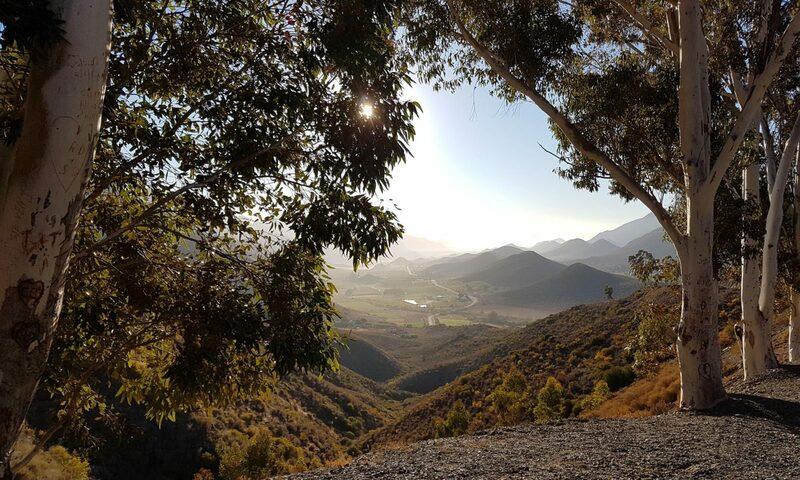 Devoid of traffic and other distraction, there really is just two things to focus on – keeping the pedals turning, and the adventures that the fitness you are building will lead towards. And, if you have an imagination that likes to wander, those roads can never get boring – because you have no idea where they will take you – long empty roads, high mountains, a far distant horizon. If I stay away too long, the mists roll in and the dreams become cloudy and hazy. But it literally takes one visit for them to return full force, their colours vibrant, and the views crystal clear. That happened today. The trainer bike had sat unloved for a while, and the legs and spirit were reluctant from lack of use. So I stuck on The Way Out, a threshold session which I figured would encourage rather than punish me out of my recent laziness. As Mike Cotty (The Col Collective) narrated me over climb after climb, my legs settled down into the task in front of me. The panel of numbers started to look after themselves, leaving my mind free to drift off to those dreams again. Watching the stunning alpine scenery pass by on my computer screen, it was impossible not to imagine riding them some day, perhaps even next year as part of TCR 2017. Secret behind the scenes training…, is what I call it. No bloody wonder you ride so well..!! Haha. I have to do something to try and keep up with you guys!